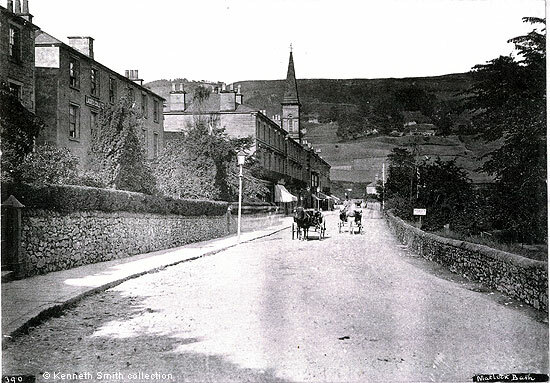 An early photograph of Fountain Villas and Derwent Parade, that form part of North Parade. It was taken at a very similar time to the previous image, although there is one small difference. The shop signs are unreadable but at no. 3 Fountain Villas is a sign-board advertising a "Ladies College", which is not on the previous image. This was the school run by the Misses Peall. The sisters were in Matlock Bath by 1867, when they advertised a school on Temple Terrace. By 1873 Miss Helen was advertising a boy's school at Violet Cottage in Matlock and Miss Peall was at Brunswood House. These two advertisements were probably both referring to Helen Peall as she was the elder of the two sisters who stayed longest in the village. The sisters moved to Fountain Villas in 1877 and continued at Matlock Bath until 1886, when they last advertised for pupils. "Superior and Modern Education for Young Ladies on very moderate terms. Pupils have successfully passed various examinations. Visiting professors for accomplishments, languages, &c". The sign on the right announces "Boats for Hire". Original photograph, marked Matlock Bath, no. 390, in the collection of and provided by and © Ken Smith. See references to the Misses Peall and their Matlock Bath school in the 1871 census | the 1881 census | Kelly's Directory 1876. Also see Matlock & Matlock Bath Public Notices & Announcements, 1867. By 1891 Frances and Helen Peall were living at Rose Cottage, Oxford Street, Whitstable, which seems to have been the property of their brother. Helen Elizabeth Peall died in Kent in 1907 and Frances Julianna Peall died there in 1910. Maria L Peall, who also lived at Matlock Bath for a time, died in 1924. All three sisters were buried at All Saints', Whitstable. An advertisement in "The Derby Mercury" of Wednesday 24 January 1877 shows Miss Peall was still at Brunswood House but she was advertising in the same newspaper for the autumn term on Wednesday 29 August 1877 at the Ladies College. "The Derby Mercury", Wednesday, 8 September, 1886. "During August, address. MISS PEALL, 1 Stockleigh-road, St. Leonard's-on-Sea".